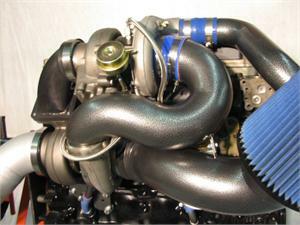 Any web shipping quote on our Twin Turbo Kits is an ESTIMATE. Additional charges may apply. Our 3rd gen twin turbo kit is hand built in the good 'ol USA by skilled craftsmen/masters of their trade. We build this stuff for ourselves. We insure that it works, insure that it fits, prior to ever bringing it to the market for you, our customer. Our customers are our friends, our advocates, our allies. You, our customer, allow us to move forward with new technologies, new programs & new products. We don't mass produce our products, or farm out for cheap labor overseas. Quality takes time, time costs money. While we clearly don't have the cheapest products out there, we like to think we offer you the best value. We invite you to compare our quality. Our testing showed that using the stock turbo charger from this vintage of Ram to not be conducive to peak performance. The tiny 9cm exhaust housing quickly becomes the bottle neck in a twin turbo set up. Exhaust gas temperatures & exhaust drive pressures climb at such an unacceptable rate, we chose to not offer a set up that utilizes the stock turbocharger. For our top charger we've chosen the Schwitzer 300 in 3rd gen style format. Our premium kit uses a 62mm compressor wheel, 65 mm exhaust wheel, with either the .7 (12cm) or .8 (14 cm) exhaust housing. Our primary charger is the T6 flanged, full framed Schwitzer 400. 75 mm compressor wheel, 96 mm exhaust wheel with the 1.32 ar housing. This set up spools quickly with moderate fueling & is incredibly drivable. The streetabilty of this set up is fantastic. It is flat out enjoyable to drive. My advice is, if you are not ready to invest in a set-up like this, don't ride in or drive a similar equipped truck. Once you've tried it, had the twins experience, you'll never be satisfied with a single turbo again. Two turbos ARE better than one. This particular set up supports 650 hp give or take. For you horse power hungry folks, several upgrades to either or both turbos are available. On our dyno page we show some common set ups & achieved horsepower & torque. Our 2005 4x4 company drag truck developed over 900 RWHP & ran the standing 1/4 mile in 10.34 seconds, using diesel fuel only. We used this same kit with a 64/71/16 S300 over a standard cover S480. We offer full kits with both turbochargers. We offer our 2/3rds kit for those of you who have already upgraded your top charger. With or without the 2nd generation style exhaust manifold, which is required. We are selling some individual pieces for this kit. Not to the extent of our 2nd generation twin parts, but we still want to help you do it yourselfers. Watch our record breaking runs below.